With each passing day your supporters, donors, activists and sponsors are becoming overwhelmed by the barrage of tweets, status updates, text messages, and emails being thrown at them on a daily basis. As a result, text-based “Thank You” messages are often unread and overlooked. That said, a video can often communicate your appreciation better than the written word and the eight videos below will help inspire your nonprofit to create a “Thank You” video. With peak fundraising season beginning in six months, that gives you plenty of time to create a video that both inspires and communicates your gratitude. Here’s the one we did for the Alabama Social Media Association. 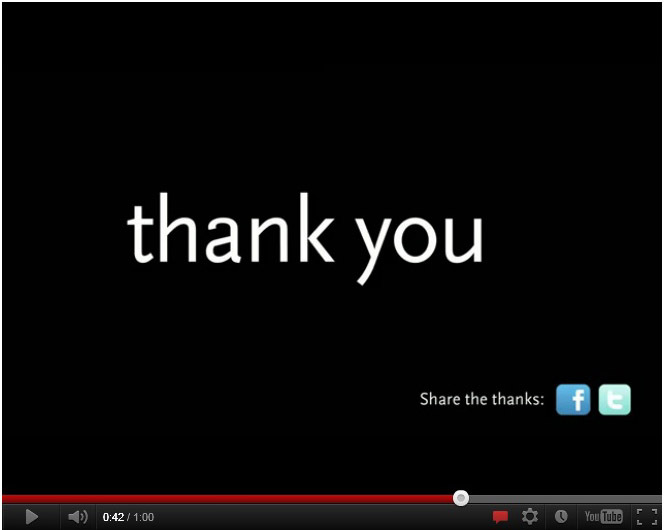 Great examples of “thank you” videos by nonprofits! “Thank you” for highlighting us! Great minds think alike here is the thank you television commercials we used in the Kansas market. They helped share our message with real stories and have been well received. We are seeing an increase in foster and adoptive parents. Hi Jennifer… I didn’t create any of these. Thanks. Can’t view the video… is it on YouTube? Sorry about that. Try this link https://dl.dropbox.com/u/2028480/MIS_2012_v2_C.mov It is on You tube also http://www.youtube.com/watch?v=ZmYcDm3j8Ko&feature=plcp Thanks!